PortaFab manufactures a number of standard cleanroom window units that integrate seamlessly with its modular wall and ceiling systems. Windows can be hermetically sealed while insulated glass units or double flush glazing can be easily incorporated into most designs. Cleanroom windows can also be integrated into return air walls to minimize any air flow disruption. Designed specifically for cleanroom applications, the absence of a ledge on this window makes it easier to clean while the design eliminates corners that often collect dust, particles, and other micro organisms. It is a cost effective alternative to double flush window systems that often require two separate pieces of glass and this design helps with achieving FDA compliance. 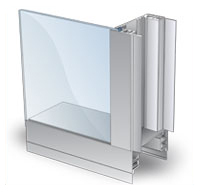 The Beveled cleanroom window can integrate with CleanLine and Fabline systems. 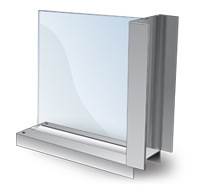 Windows are mounted into the wall system to provide a completely flush surface. To minimize any air flow disruption, windows can also be integrated into return air walls. Insulated glass units or double flush glazing can be easily incorporated into most designs. The Flush cleanroom window can be integrated into all 3 cleanroom wall systems (CleanLine, Fabline, and PharmaSystem). 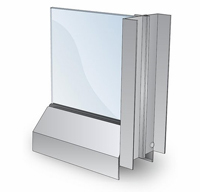 Designed for interior wall applications that require flush surfaces on both sides of the wall, the double flush window system provides and attractive appearance and two completely flush surfaces. The Double Flush cleanroom window can be integrated into all 3 cleanroom wall systems (CleanLine, Fabline, and PharmaSystem). These economical windows from our line of inplant offices include fixed windows that measure either 4' or 2' wide by 3' high and sliding windows that measure 3' x 3'. 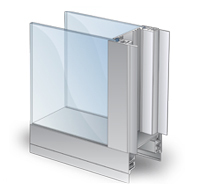 All standard windows feature 1/4" clear tempered safety glass, but we also offer laminated glass for added sound control, insulated glass for better thermal insulation, and break resistant polycarbonate windows. Standard CleanLine Window can integrate with CleanLine S3000 and PM458 wall systems (not P2000). Available window sizes will depend on the wall system being utilized, but various sizes are available and easy to integrate into most applications.